The author of Where the Wild Things Are would have been 90 years old on June 10, 2018. 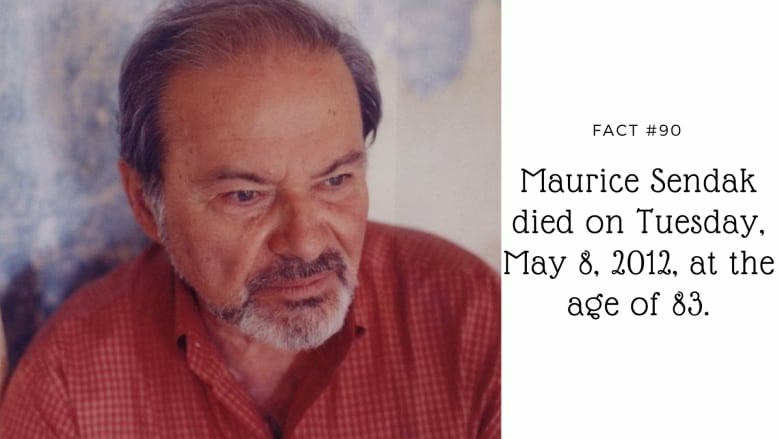 Maurice Sendak was born on June 10, 1928, making 2018 the 90th anniversary of his birth. From childhood through the publication of Where the Wild Things Are and into old age, Sendak explored in his work what it means to be alive. To celebrate Sendak's life and work, CBC Books has compiled a list of 90 things you might not know about the popular children's author and illustrator. 1. 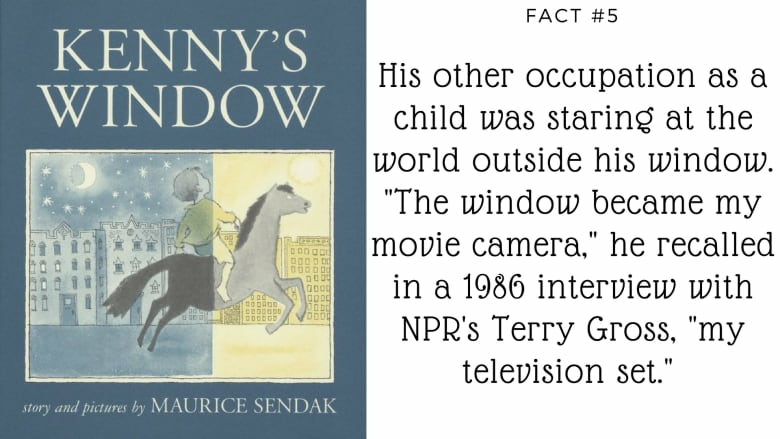 Sendak was born on June 10, 1928. 2. He was the third child of Jewish immigrants from Poland. 3. Sendak had two siblings — Jack, who was five years older than him, and a sister, Natalie, who was eight years older. 4. As a child, Sendak was frequently ill and spent most of his time in the kitchen with his mother, who often played games with him. 8. In Grandpa's House came out of a collaboration with his father. To create the 1985 children's book, Maurice Sendak illustrated a story his father, Philip, originally wrote in Yiddish while mourning his wife's death. It follows a child who is carried by a bird to his grandfather's house and witnesses violence among creatures on the ground. 9. Sendak was largely a self-taught artist. Selma G. Lanes, writing in 1979 for The New York Times, declared his illustrations works that "elevated the American children's picture book to a high art form." 11. A tour of Sendak's studio in 1966 revealed "an extensive collection of children's books, formed largely around Sendak's favorite illustrators." These included the drawings of George Cruikshank, a 19th-century English artist who illustrated the works of Charles Dickens. 12. 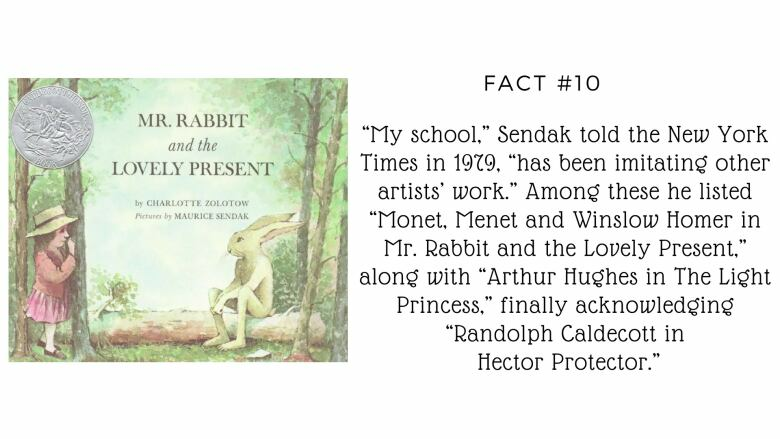 Sendak admitted to having an affinity for the work of English artists of the 19th century. He called that century "my bed" and explained that, from artists like Thomas Rowlandson, he "borrowed techniques and tried to forge them into a personal language." 13. 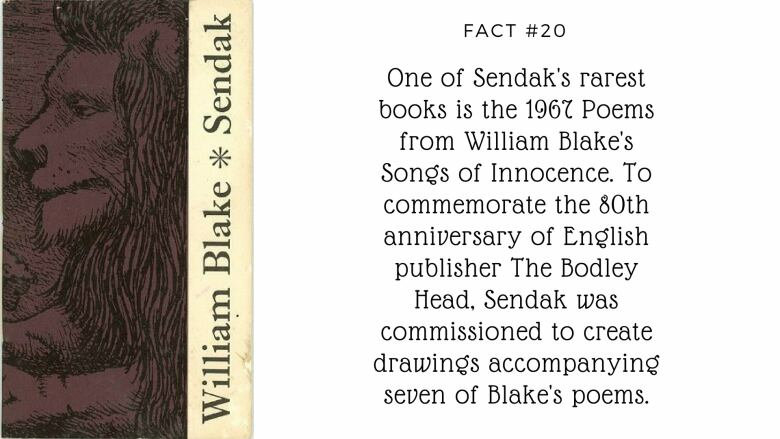 An important influence on Sendak's work was the art of William Blake (1757-1827). He called Blake "my teacher in all things." 14. Sendak was an atheist, and once remarked, "I don't believe in God, but if I did it would be Blake." 16. William Blake's influence appears in his posthumous publication, My Brother's Book. Avi Steinberg, in his The New Yorker article, observes parallels between My Brother's Book and Blake's poem Milton, which also explores brotherly bonds. 17. Blake's work was also part of a legal dispute between Sendak's estate and Philadelphia's Rosenbach Museum. Sendak owned two highly collectible illuminated books by Blake, prized by his estate and the museum where these items were housed. 18. Until 2014, the Rosenbach Museum had "about 10,000 items of Sendakiana," including original artwork and rare books he collected. The first item the museum received from Sendak entered its archives in 1968. 19. Sendak's artwork, manuscripts and other material have found a new home. In 2018, the Maurice Sendak Foundation designated the University of Connecticut Library, Archives & Special Collections as the repository for the thousands of pieces related to his work. 21. Only 275 copies of the first edition of Poems from William Blake's Songs of Innocence were printed. 22. Poems from William Blake's Songs of Innocence came out the year his dog, Jennie, died. According to Elizabeth Derbecker, library assistant at the Osborne Collection of Early Children's Books, Sendak had mentioned that he could never look at the book. 23. Jennie is featured in the 1967 publication Higglety Pigglety Pop! She was the inspiration for the lead character and is the book's sole dedicatee. 24. Higglety Pigglety Pop! is based on a Mother Goose rhyme and tells the story of a dog who leaves her home to explore the broader world. 25. A blend of live-action and animation was used to adapt the book into a short film, titled Higglety Pigglety Pop! or There Must Be More to Life. Sendak was an executive producer on the project. 26. The short film is a Canadian co-production between the National Film Board of Canada and Warner Home Video. Clyde Henry Productions was in charge of the direction. The complete short film appears on the Blu-ray edition of the 2009 film Where the Wild Things Are. 27. Jennie was a Sealyham Terrier. 28. Jennie appears in Sendak's other work, including Where the Wild Things Are. The dog seen fleeing from Max shares many of Jennie's characteristics. 29. The characteristics that would come to define Max in Where the Wild Things Are were developed earlier. Specifically, the 1962 collection of stories and rhymes known as the Nutshell Library contains small boys that resemble Max. 31. Sendak stuffed his house with Mickey Mouse memorabilia, which "he examin[ed] in periods of depression." 32. Sendak dreamed of one day working for Disney. In a 2005 interview with NPR, he mentioned, "I wanted to work for Disney. I wanted to be an animator. Everything I drew had big shoes with shines on them, like Mickey, and every time they ran, there was a little trail of smoke puffing right behind their feet." 37. Sendak credited Winsor McCay, creator of the newspaper comic strip Little Nemo in Slumberland, as another artistic influence. 40. Sesame Street featured Sendak's illustrations. A 1970 segment titled Bumble-Ardy tells the rhyming story of a boy left at home alone until nine swine arrive for "birthday cake and wine" and refused to leave. 41. Bumble-Ardy became a picture book published in 2011. Sendak wrote and illustrated the familiar story, but replaced the main character of the boy with a pig. 42. Bumble-Ardy's publication marks Sendak's return as both writer and illustrator. Before this, 1981's Outside Over There was the last time he worked in both capacities on a picture book. 43. 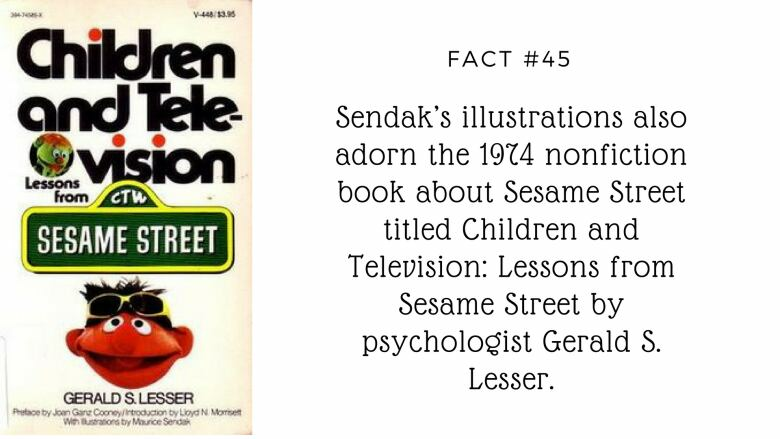 Sendak was also involved with Sesame Street. He held the position of member of the National Board of Advisors for the Children's Television Workshop (CTW), which is now called Sesame Workshop. 44. As a board member of CTW, Sendak consulted on storyboards and show outlines. 46. According to Susan Tofte, a former Sesame Workshop's archivist, "Sendak also drew the first logo that appeared on early CTW stationary and press releases." 47. Another of Sendak's illustrated work to be turned into a television series is Else Holmelund Minarik's Little Bear. The Canadian children's television series aired 65 episodes from 1995 to 1999. 48. Sendak Illustrated all five of the original Little Bear books. 49. HarperCollins, the publisher of the Little Bear books, stated that over 12 million copies of the series had been sold at the time of Minarik's death on July 12, 2012. 51. 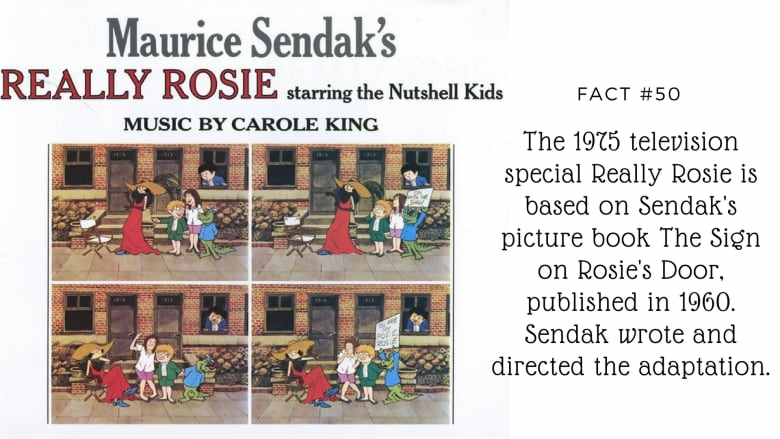 The Sign on Rosie's Door was adapted into a musical with vocalist Carol King, who voiced the main character in the television special. 52. In high school, Sendak worked for All-American Comics, a precursor to DC Comics. 53. At All-American Comics, his tasks included working on the backgrounds and storylines of comic strips like Mutt and Jeff. 56. In her history book Through the Looking Glass, Selma G. Lanes mentions he intended to sell his wooden creations to the New York toy store F.A.O Schwarz, but "the toys would have been too expensive to produce in quantity." 58. It was at the toy store that he met Harper & Row editor Ursula Nordstrom, who was taken with his work. 59. Nordstrom introduced Sendak to the world of book publishing. According to Through the Looking Glass, "after seeing his sketchbook, she invited him to illustrate his first full-fledged entry into children's books, Marcel Aymé's The Wonderful Farm." 62. In addition to the guidance she offered Sendak, Nordstrom was instrumental to the careers of notable children's authors such as E.B. White and Shel Silverstein. 63. 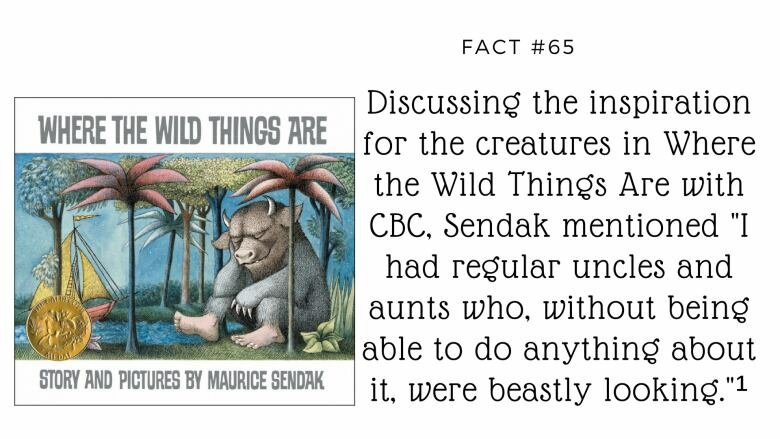 Sendak credits Nordstrom as the reason Where the Wild Things Are exists. In Tell Them Anything You Want, he recognizes that she gave him the courage to go ahead with the book's publication in spite of his crippling doubt, stating "she made me who I am." 64. The back and forth between Nordstrom and Sendak during the production of his famous picture book is captured in a 1998 anthology of her letters titled Dear Genius. Gracing the front cover of the collection is a portrait of Nordstrom created by Sendak. 66. In turn, Where the Wild Things Are has inspired several generations of children. Among its fans is President Obama, who read it to the children gathered at the White House's 2016 Easter Egg Roll. 67. In 1964, Where the Wild Things Are won the Caldecott Medal, an annual award recognizing distinguished works of illustration in children's literature. 68. During his acceptance speech, he identified Where the Wild Things Are as a turning point in his life as an artist. "With Where the Wild Things Are, I feel I am at the end of a long apprenticeship. By that I mean all my previous work now seems to have been an elaborate preparation for it." 69. Characters from Where the Wild Things Are appear in Sendak's Dec. 30, 1976 cover illustration of Rolling Stone magazine. 71. 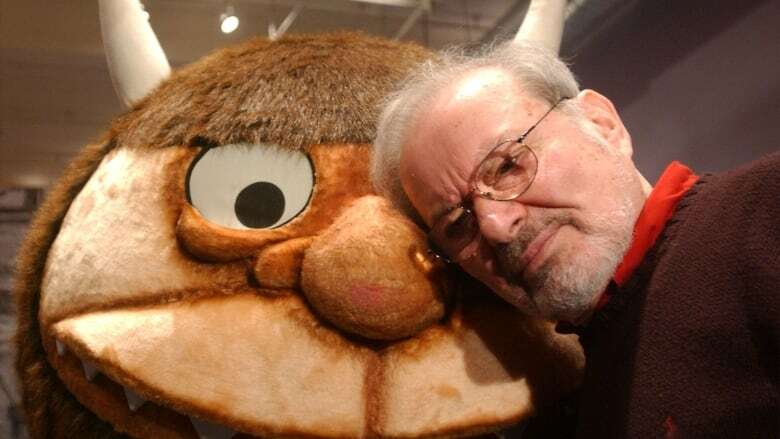 Sendak was supportive of the film adaptation of Where the Wild Things Are, working closely on the production with Spike Jonze and declaring, "it maintains its peculiarness as a work." 72. Although he remained a secular individual, Sendak embraced his Jewish identity as an illustrator. This is evident in the picture book Good Shabbos Everybody, a work funded by the United Synagogue Commission on Jewish Education. 73. Sendak also illustrated the short stories of Yiddish Nobel laureate Isaac Bashevis Singer. The picture book is titled Zlateh the Goat and Other Stories and was published in 1967. 74. The only pop-up book Sendak illustrated was the 2006 work Mommy? It tells the story of a boy too preoccupied with the search for his mother to be scared of the monsters he meets along his journey. Matthew Reinhart was in charge of the paper engineering and it was written by Arthur Yorinks. 75. 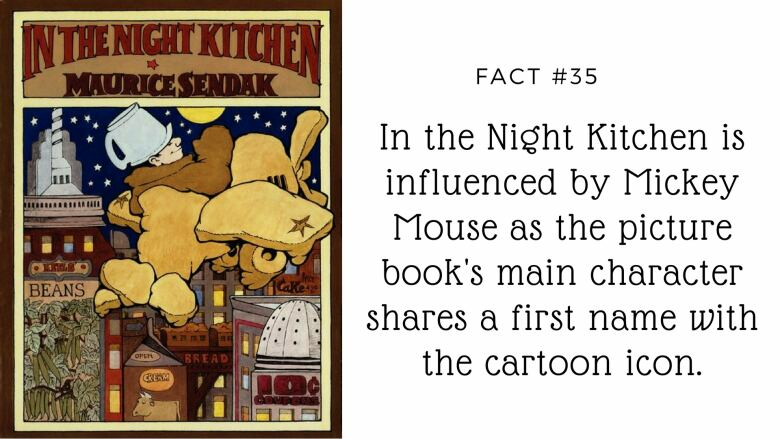 Together with Yorinks, Sendak formed The Night Kitchen Theater, staging productions throughout the 1990s. 76. During the 1980s, Sendak's had an active stage career as he worked on costumes and background for operas. One set he designed was for the 1980 performance of Mozart's Magic Flute by the Houston Grand Opera. 77. 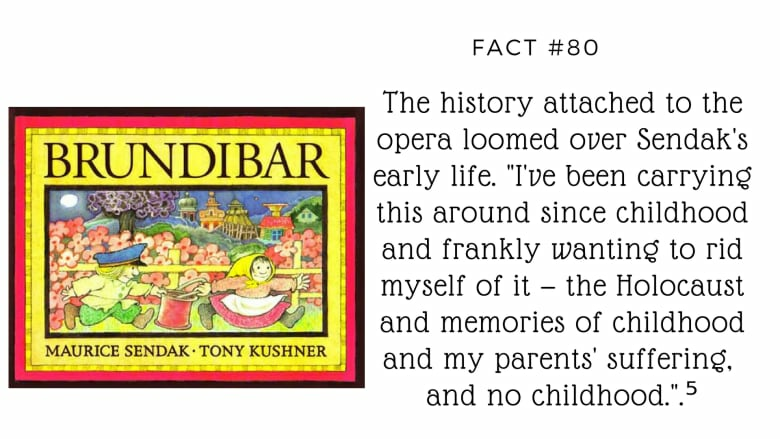 Sendak's body of work also covers other kinds of opera. Angels in America playwright, Tony Kushner, adapted Hans Krása's children's opera Brundibár into English, with Sendak illustrating the picture book. The two also worked together on bringing this version to stage in 2003. 78. Sendak worked along with designer Kris Stone on the production's sets. A review in The New York Times noted, "The production is handsome without being flashy. The evocative sets by Ms. Stone draw on the muted colorings and signature lines of Mr. Sendak's work." 79. Brundibár was originally written in 1938 by Czech composer Hans Krasa for a children's orphanage in Prague; but under Nazi rule, children of the Terezin concentration camp were made to perform the opera to convince outsiders that they enjoyed life in the camp. 82. Sendak is also a character in his own work. According to Derbecker, "He said every chunky, dark-haired boy was him." This stock character can be seen in the 1960 picture book Open House for Butterflies, written by Ruth Krauss. 83. 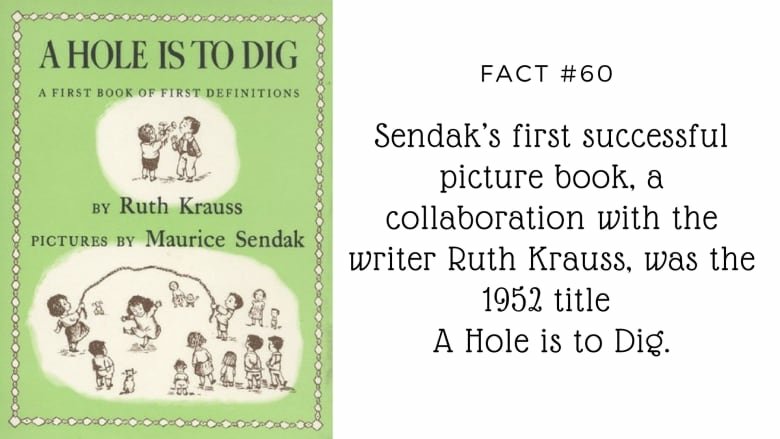 Krauss and Sendak worked together on eight books. One of these was the 1953 picture book A Very Special House, for which Sendak won his first Caldecott Medal in 1954. Open House for Butterflies marks the last of these collaborations. 84. The Brothers Grimm also received the Sendak treatment. In 1988, he illustrated their story, Dear Mili, about a girl sent to the forest to seek shelter from war and who emerges after three days only to realize 30 years have actually passed. 85. The 1988 edition of Dear Mili is based on a 2,500-word manuscript discovered in 1983. Publisher Farrar, Straus and Giroux purchased the original letter written in the 19th century to a little girl called Mili. Sendak was enlisted to work on it as a an admirer of the Grimms. In a 1983 interview, he told CBC's The Journal, "There is not a shred of hypocrisy or falsehood in those stories." 86. 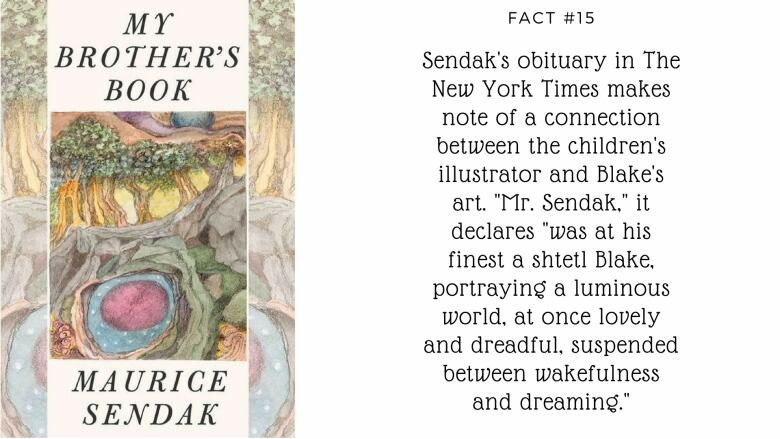 Sendak's illustrations of Dear Mili include references to Jewish history. Julie Salamon of The New York Times once noted that the book "incorporates images of French Jewish children before being deported to Auschwitz and Jewish tombstones tucked into a lush, overgrown garden." 88. The same documentary closes with Sendak's realization that he was never happier than when he drew and wrote. "Doing books, doing pictures," he shares, "is the only true happiness I've ever, ever enjoyed in my life."